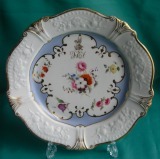 An early Machin armorial dessert plate c.1810 with a relief-moulded border, the center painted with flower sprays on a light blue ground and a family crest painted in gilt. 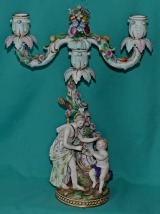 Dimensions: 22.5 cm diam. Unmarked. Excellent condition. * John Harbold queried the earlyer attribution in Godden's Ridgway book, Margaret Ironside re-atributed this shape to Hicks & Meigh. 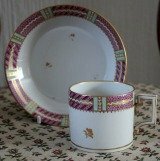 * This pattern is illustrated in the book "The Illustrated guide to Ridgway Porcelains" by Geoffrey A. Godden 1972, Plate 22. 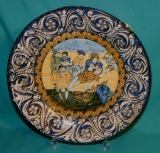 A Machin Porcelain Dessert Plate c.1815-20, the border with relief-moulded flowers on cobalt blue ground, the centre finely painted with fruit, gilded rims. 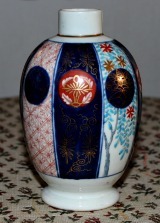 Dimensions: 22.5 cm diam. Fine condition. Unmarked. * This shape is also known as "Harbold" (John Harbold queried the earlyer attribution in Godden's Ridgway book), Margaret Ironside re-atributed this shape to Hicks & Meigh. 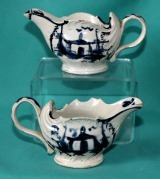 A Part Machin Porcelain Teaset, comprising a "New Oval Shape" teapot, cover and stand, milk jug, bute shaped tea-cup and saucer, bat-printed in black, Pattern 184 c.1810. Dimentions: teapot 26cm. 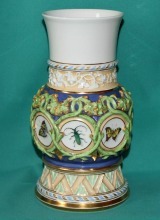 from handle to spout x 16cm. 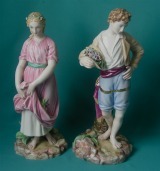 high, stand 19cm. 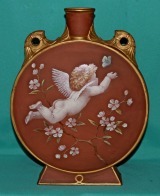 x 15cm, milk jug 10.5cm. 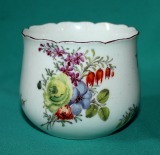 high, cup 5.5cm. 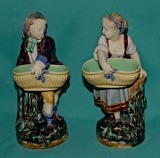 high x 8cm. 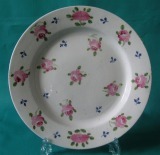 diam, saucer 13.5cm. diam. Marks: Painted 184 in black (on the base of the teapot and the stand) Condition: Teapot cracked. 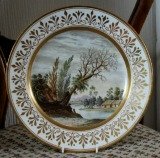 A Machin Porcelain Plate, painted with floral pattern, c.1815. 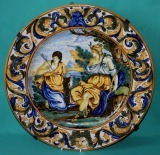 Dimensios: 22cm. diam. Marks: Painted 381* in blue. Fine condition. 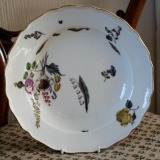 A part Machin* Porcelain Dessert Set, comprising 8 plates and 3 dishes, painted with flowers in the sentre, the "Moustache" border decorated in cobalt blue, cream and gilt, c.1825. 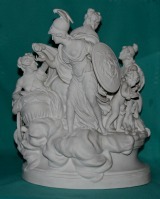 Dimensions: 22cm diam. Marks: 733 painted in black, red and gilt. 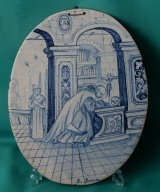 Condition: 3 plates with small hairline, some ware on the gilding. 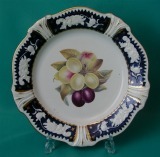 A Machin Porcelain Dessert Plate, moulded drop shell edge, finely painted with flowers and fruit on an apple green ground highlighted in gilt c.1825. Dimensions: D.9". Marks: pattern 762 painted in red. Condition: Minor ware and crazing.